This listing of job and career events is updated on a regular basis. For more information, call (405) 733-7488. The Career Services Center is your resource for career and employment services including career exploration, job search, career planning, internship opportunities, career fairs, and workshops covering interview skills, resume and cover letter writing. If you would like assistance interpreting or discussing your results, get in touch with career services at career-services@raider.rose.edu. If you enrolled at Rose State not quite sure what career and related major to pursue you are not alone. Other times students think they know their career path only to find for various reasons they want or need to make a change. Rose State is here to help! The college offers personal career advisemetn for any student who wishes to discuss career options and clarify plans for the future. An appointment is suggested. Please email career-services@raider.rose.edu to set up your introductory 30-minute session with a career advisor. Students will develop a targeted resume using the correct resume format. Students will develop a targeted cover letter. Students will identify their achievements, accomplishments, knowledge and skills in order to effectively market themselves for employment. Students will know how to prepare for an interview, and minimize the anxiety associated with the interview process. 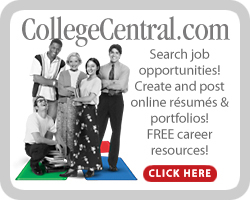 Rose State College uses College Central Network as its official resume and job posting service.